Create the perfect book for your course. Choose from a selection of 225 readings on a variety of sociological topics. 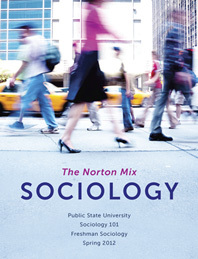 Combine with chapters from Norton’s best-selling sociology textbooks. Mix and match from 225 sociology readings as well as chapters from You May Ask Yourself and Essentials of Sociology. Suggested tables of contents tailored to You May Ask Yourself and Essentials of Sociology give instructors a starting point. The Norton Mix: Sociology gives you greater flexibility in course design and lets you control the price. The database site makes it easy for professors to find what they want. Users can search the database by author; by title; by date (pre–1960, 1960–1979, 1980–1989, 1990–1999, 2000–present); by topic, by textbook; and by length. Professors should be able to find a syllabus’ worth of readings and textbook chapters to support their course no matter what the approach. The process of creating a book will also be monitored by Norton’s custom editor at every step, so that professors will receive guidance as they create their perfect text. The database includes a wide range of readings, including clusters on family, race, criminology, environmental sociology, and stratification, among others. A variety of search functions make it easy to find what you want.